Students at the event got the chance to commemorate their spring semester kickoff at a photobooth. Photo by Lee Choo. 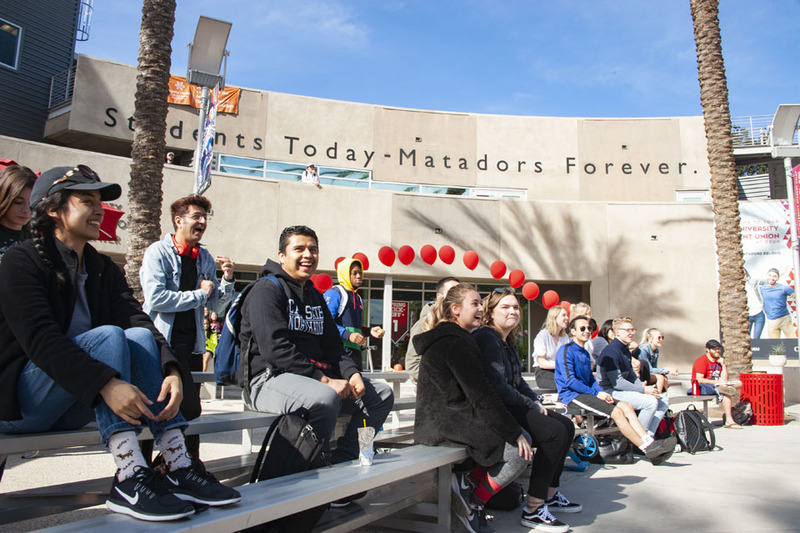 Matadors joining the festivities were invited to take a seat on bleacher to enjoy the live DJ and performances and the Spring Kickoff 2019. Photo by Patricia Carrillo. 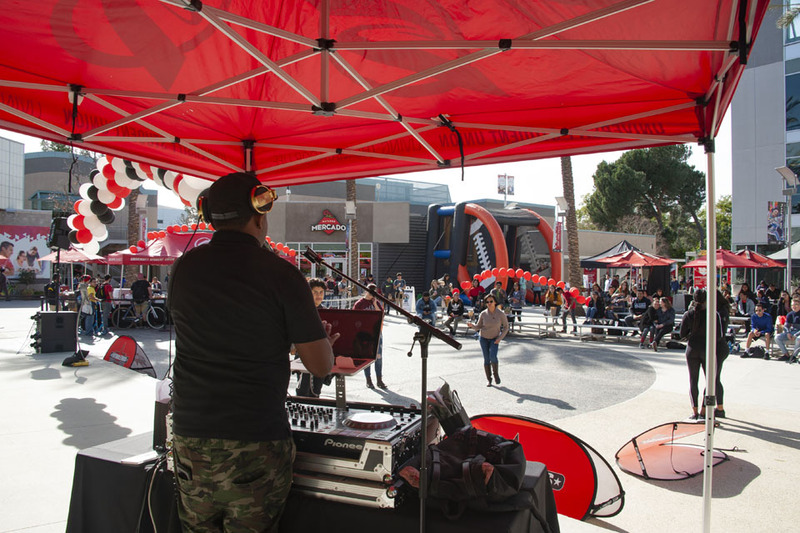 A live DJ kept the party going at the Spring Kickoff 2019, hosted by California State University, Northridge's University Student Union. Photo by Patricia Carrillo. Students joining the annual Spring Kickoff event got to enjoy free food. Photo by Lee Choo. Cheerleaders from the CSUN Cheer Team performed with stunts and cheers at the annual Spring Kickoff event. Photo by Lee Choo. 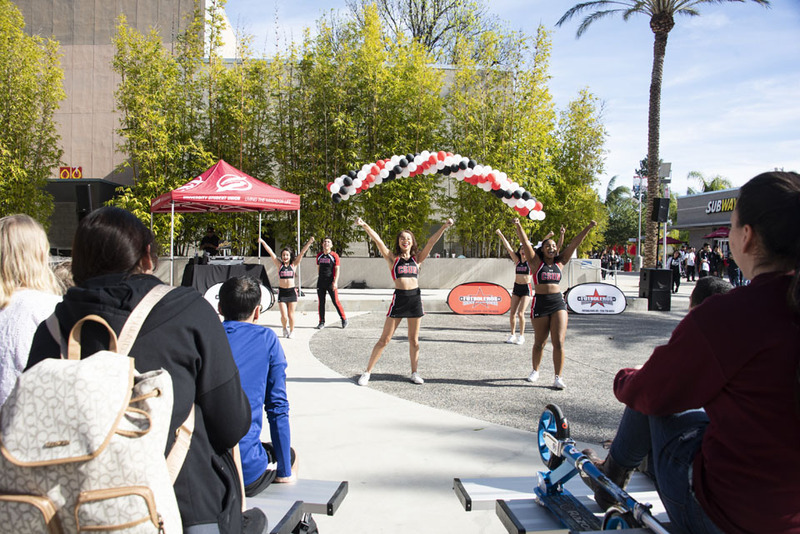 CSUN Cheer Team brought Matatude to the Spring Kickoff 2019. Photo by Lee Choo. 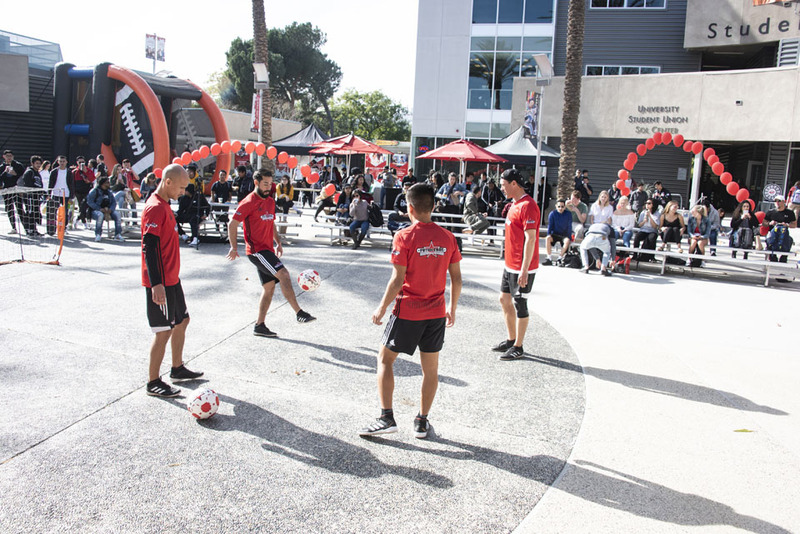 Futboleros, a soccer entertainment company, was one of the performances Matadors got to enjoy at the Spring Kickoff. Photo by Lee Choo. 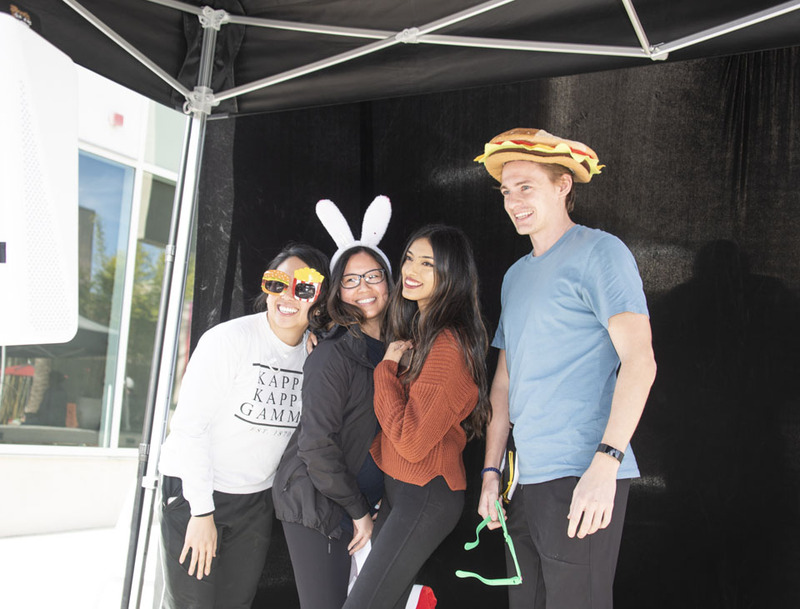 The spring 2019 semester at California State University, Northridge got off to a fun-filled start with the University Student Union’s annual Spring Kickoff event on January 24. Music and large inflatable games greeted new and continuing Matadors as they made their way to the USU’s Plaza del Sol. 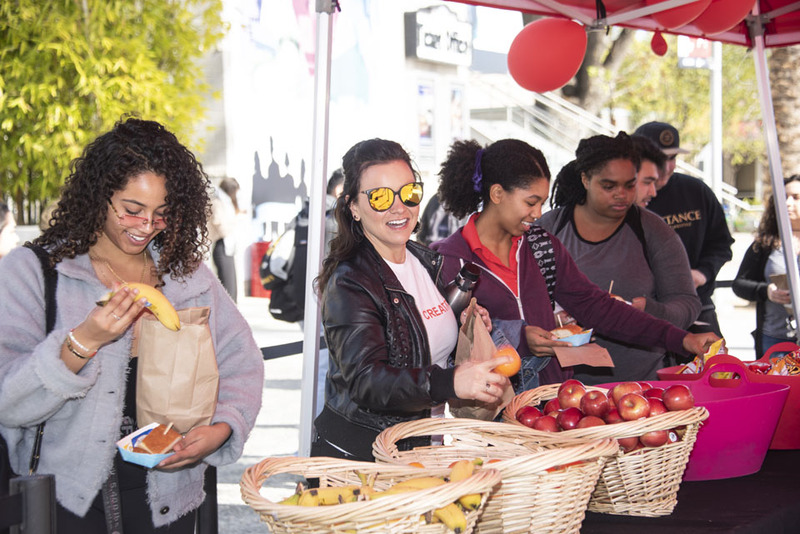 Students were invited to grab a free meal and take a seat on bleachers added to the Plaza so they could enjoy a live DJ and performances. One performance was an energetic routine of dance and stunts by the CSUN Cheer Team that brought Matatude to the USU. In between performances were opportunities for students to win fun prices in a set of competitions, including a game of “Simon Says,” a dance challenge and pick-up soccer games. Students also had the chance to challenge their friends to a variety of games, including giant Jenga, a field goal challenge and an inflatable basketball hoop, before commemorating their spring semester kickoff with a series of photos at the pop-up photo booth.